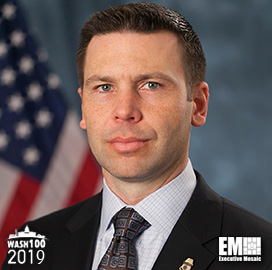 Executive Mosaic is pleased to announce that Kevin McAleenan, commissioner of U.S. Customs and Border Protection, was inducted into the 2019 edition of the Wash100 — Executive Mosaic’s annual selection of the most influential voices in the government contracting arena — for his efforts to develop counterterrorism strategies and support border security effort with new initiatives. This latest honor marks his second consecutive Wash100 win. After serving as the acting commissioner for an entire year, he was nominated by President Donald Trump to become the CBP commissioner and received Senate approval in March 2018. McAleenan manages approximately 60,000 employees and a $13B annual budget for the agency. In July 2018, the U.S. Army Corps of Engineers announced a prequalification of sources for the Department of Homeland Security’s prospective $1.8B border infrastructure program. The CBP provided $1.6B in 2018 for procurement, construction and improvement funds that the agency used to work under the Army Corps current solicitation. Potential projects under the new solicitation can cover border fencing, gates and lights, patrol roads and other alterations. SLSCO also landed a $287M contract with CBP to build two border walls covering 29 miles in Southern California. In addition, the agency announced its plans to award a blanket purchase agreement in March with a one-year base ordering period and four years of options to develop financial systems, business processes and business intelligence services for the agency. CBP also awarded Harris two contracts worth a combined $26M to update the communications systems that support the agency’s missions. Before his appointment as acting commissioner in January 2017, McAleenan served as the deputy commissioner for CBP for five years. His leadership helped the agency develop strategies protecting U.S. borders from terrorism and attacks from transnational criminal networks. He also worked on the development of CBP’s trade transformation agency, which will help the country compete in the global economy. Previously, McAleenan served the agency as assistant commissioner and deputy assistant commissioner for the Office of Field Operations between 2010 and 2013. He first joined the CBP in November 2001 as the area port director at LAX and as executive director of the Office of Antiterrorism until February 2008. In 2015, McAleenan received the Presidential Rank Award, the nation’s highest civilian service award. He also received the Service to America Medal and the Call to Service Award for spearheading the development of a comprehensive antiterrorism strategy in border security following the 9/11 attacks. Executive Mosaic congratulates Kevin McAleenan for receiving this award.